After Bill Tracy died, his company carried on as This Is, Inc. In their 1975 catalog, Bill Tracy is listed as the founding president, Jack Seddon the president, and Tom Thaler the vice president. Seddon and Thaler carried on Bill’s work by using a lot of the same molds, designs, and fabrication techniques that he originally used, and also offered themed golf courses. This Is, Inc. was still based in Cape May Court House, New Jersey, where Amusement Displays formerly operated. 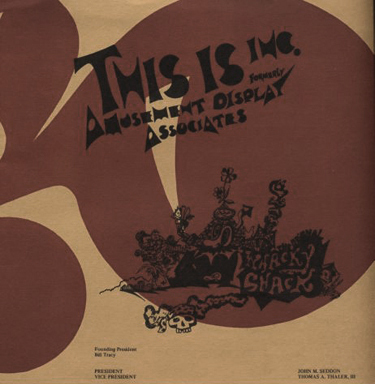 In 1976, an advertisement for This Is, Inc. also listed Doug Heun and Jim Tracey as part of the company and showed a picture of a newly-installed Whacky Shack at Pontchartrain Beach in New Orleans, Louisiana. This “new” Whacky Shack looked exactly like the attractions that Bill had built previously. In 1977, Jim Melonic took over Bill’s old company and renamed it Fantasies and Dreams. Jim Melonic is still running the company, J.M.M. Studios, today. Cover of 1975 This Is, Inc. catalog.